Enhanced Abilities: The Kraken has super human strength, endurance and durability. Body Armour: The Kraken armour alters the appearance and voice of it's wearer to protect his identity. It also provides some protection from physical and energy attacks. Teleportation: The Kraken armour enables him to transport himself and several across inter-continental distances (perhaps via accessing other technology). Energy Projection: The Kraken armour grants him short-range energy projection. Along with several other prominent leaders in the intelligence community, Daniel Whitehall was invited by Leonardo Da Vinci to join the Great Wheel in 1961. The arrangement was a simple one. In return for cooperating on a few select missions for Da Vinci, he would give all of them the means to win their own secret wars. To protect their anonymity, each member was given a codename based on the Zodiac. Whitehall was codenamed Leo. Each of the Great Wheel's missions involved the acquisition of strange technology. Whitehall teamed with Vasili Dassiev, Shoji Soma and John Garrett to salvage the power source from a crashed Brood vessel in Egypt. It was there that he revealed his Kraken power armour in order to fight off a swarm of Brood drones. Ultimately, the Great Wheel was betrayed by Dassiev and Viktor Uvarov for the acquired technology. Their alliance would become the organization known as Leviathan. They attempted to have the rest of the Great Wheel killed, but Whitehall used his Kraken armour to protect himself and fled with Baron Strucker and Shoji Soma. Their alliance would become HYDRA. 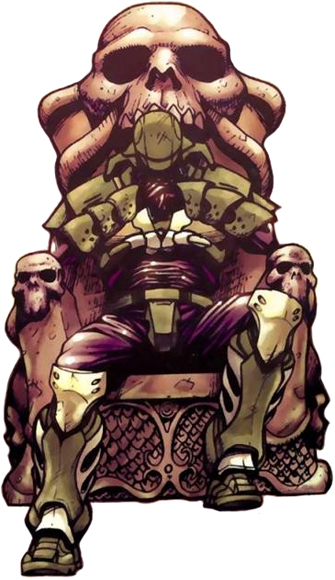 Now more Kraken than Daniel Whitehall, he was a key figure in the creation of HYDRA along with Baron Strucker. But unlike Strucker, he orchestrated things from the shadows and chose not to make himself widely known. He continued to turn people into who he believed they should be, which led to him practically creating the rest of the leadership of HYDRA.